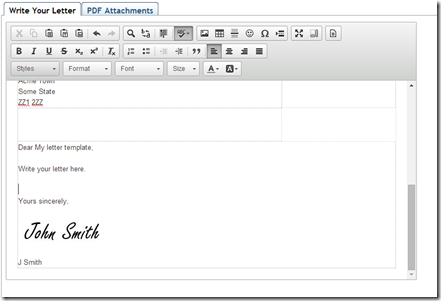 How do I include my letter head and signature in my letters? 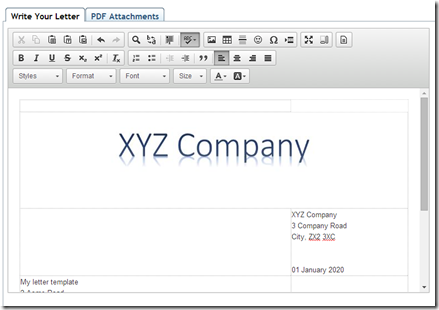 Uploading a PDF of your finished document which you can create directly from applications such as MS Word. 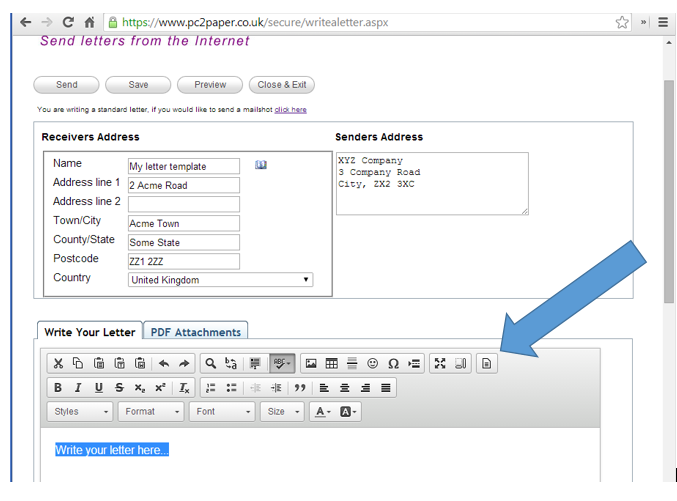 Using the PC2Paper Printer enables you to write your letter in any application on your computer and print it directly from your machine to us as a letter. 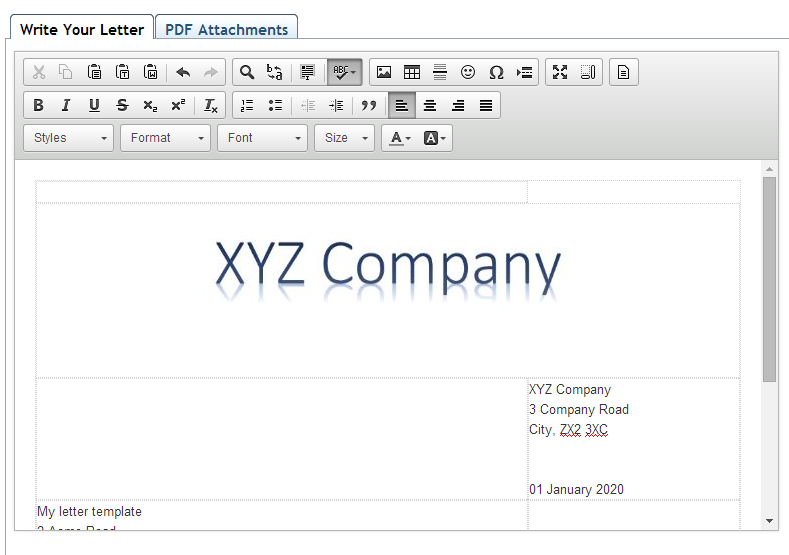 The following example will show you how to do this using our online editor and how you can re-use the same letter over and over again after setting up a saved letter as a template. 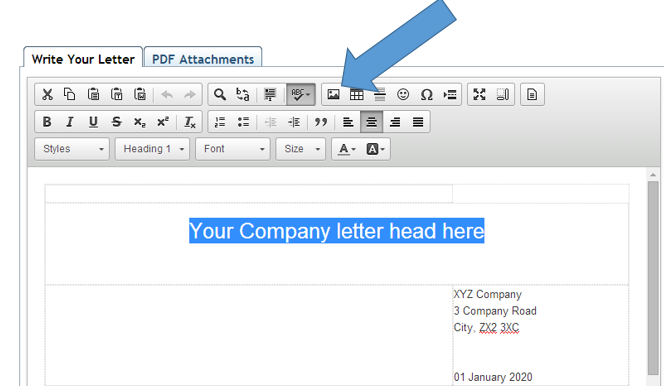 Highlight the text "Your company letter head here" then click on the images button (shown in the image below). In the dialogue that appears upload images of your letter head and signature using the "Upload Image" section shown in the image below (you can read more about inserting images into your document here). 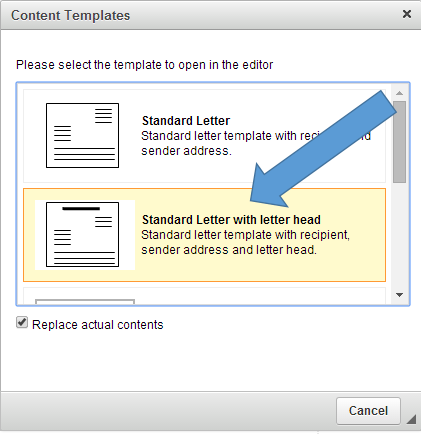 Then click on the image of your letter head you uploaded and click on OK.
Inserting your signature is exactly the same process. 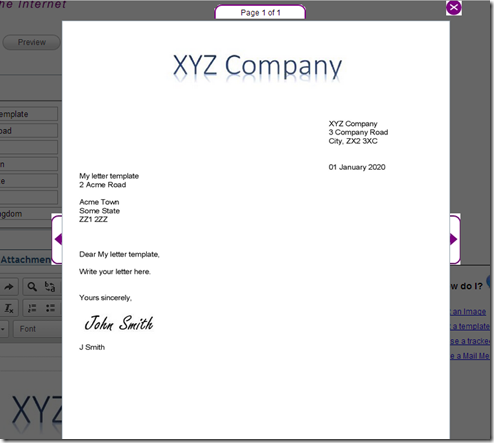 Scroll down your letter to where you wish to insert your signature and click the insert image icon and then select an image of your signature to upload. 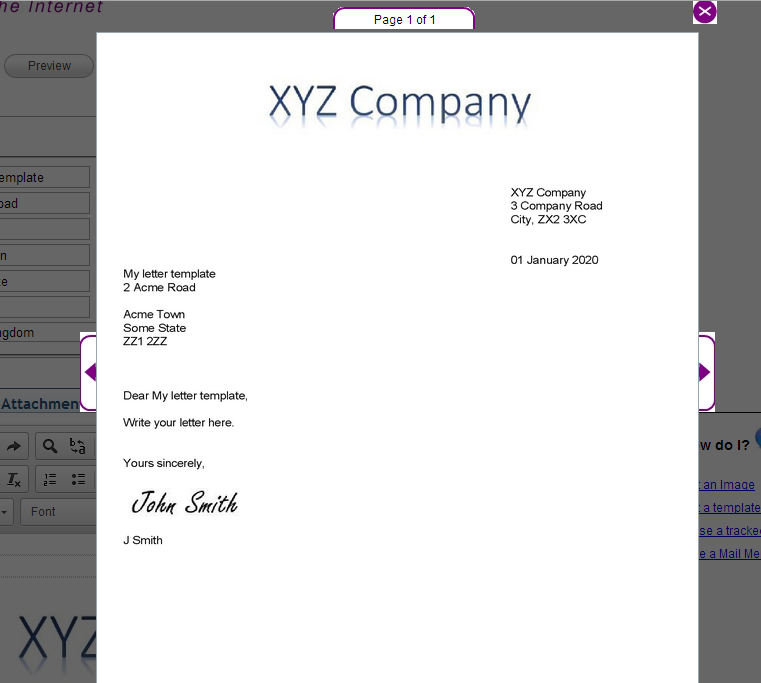 Preview your document to ensure it looks correct by clicking on the preview button found at the very top or bottom of the page. It should look similar to the preview below. You can now save your letter and create a copy of it each time you wish to send a new letter. 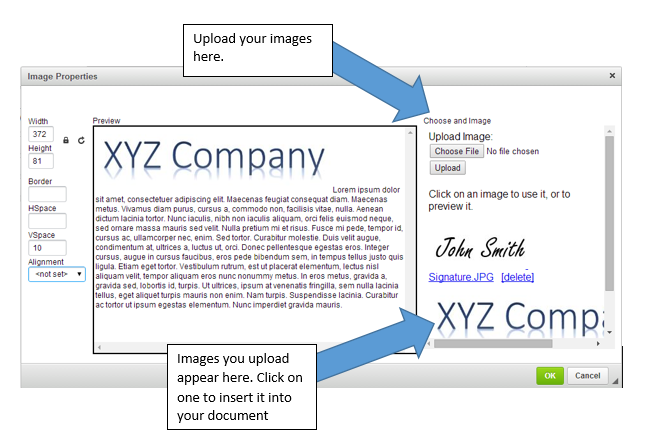 To do this close the preview, click save and then select "close & exit". 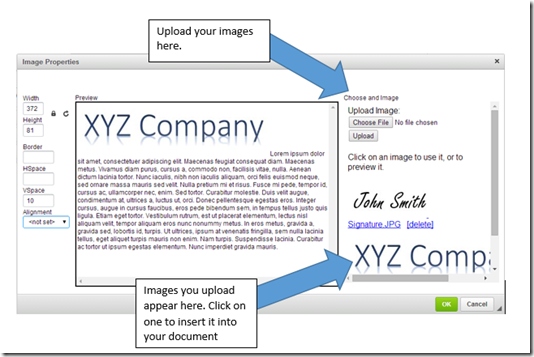 On the page that appears select the "Items Saved" tab (as shown below). 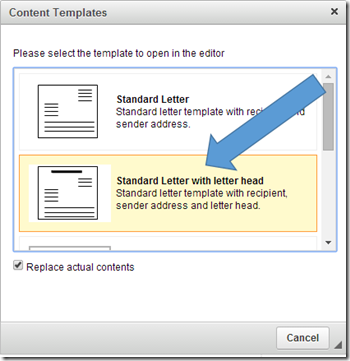 Click on the "copy as a new letter" icon next to your letter each time you wish to send a new letter with your letter head and signature. Monday the 26th of May is a Bank Holiday in the UK. There are no postal collections or deliveries on this day and the PC2Paper office will be closed. Any letters sent after our 4pm cut-off on Friday the 23rd of May will be sent on the next available working day, Tuesday the 27th of May. 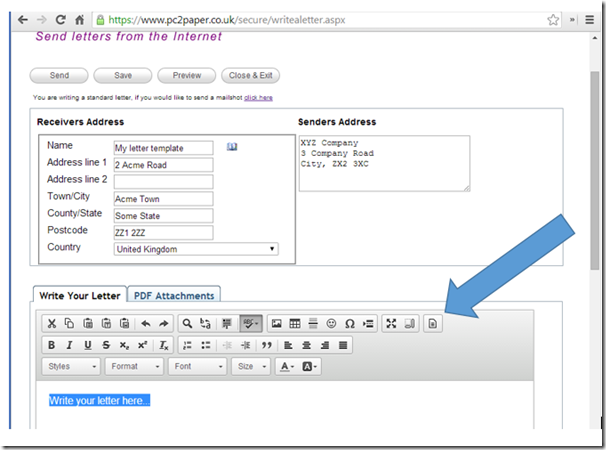 Letters sent after the cut-off time will be queued in our system until they can be processed.